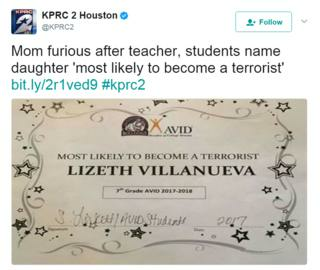 Teachers at a school in Texas are being disciplined after handing out an "award" declaring one student "most likely to become a terrorist". Lizeth Villanueva, 13, was handed the award by her teacher during a mock ceremony at the school near Houston. A local education official described the incident as "a poor attempt at poking fun". But the student's mother told a local news channel: "It doesn't look like a joke to me." The fake certificate, signed by the teacher, was handed out the day after the terrorist attack at a concert in Manchester, England, which killed 22 people, including children. Lizeth's mother contacted Houston's KPRC 2 channel about the mock ceremony, conducted with students in the advanced learning programme at Anthony Aguirre Junior High in the town of Channelview. "It was not a joke," Lizeth told KPRC 2. "I do not feel comfortable being in the same classroom with [the teacher]." The Washington Post reports that other awards included "most likely to cry for every little thing" and "most likely to become homeless", all of which were greeted with laughter from several teachers gathered in the room. Lizeth told the newspaper she had not been back to school since. The school district released a statement apologising for "the insensitive and offensive fake mock awards that were given to students". "The teachers involved in this matter have been disciplined according to district policy," it said. The incident comes days after another high-profile "terrorist" allegation was resolved in Texas courts. In 2015, Muslim schoolboy Ahmed Mohamed, then 14, was arrested in a suburb of Dallas, Texas, after his teacher said a homemade clock looked like a bomb. His arrest prompted a social media outcry and he switched to another school in the aftermath. But the discrimination case brought by his family was thrown out by the courts earlier this month.